Pakistan nation mourns the martyred children of APS Peshawar who were killed by yazidi terrorists in cold blood during a dastardly attack on the APS school last year. The horrific nature of attack and the passionate emotions of the every Pakistani on this tragedy galvanized not just the nation but all the institutions and organs of the state to finally rise from deep slumber ,building enormous consensus against terrorism and adopting a multi-pronged approach towards tackling the menace head on. The spell binding tribute song released on the occassion by the ISPR , 'mujhay maan usse badla lene jana hai ,mujhay dushman ke bachon ko parhana hai' indeed is a thought provoking and positive message for the bereaved families of martyrs and for every Pakistani. Glowing tributes are being paid to the innocent angels in various educational institutions throughout the country . A well organized investiture ceremony to posthumously decorate the martyrs of tragedy with Tamgha-e-Shuja'at is taking place at APS Peshawar at the time of compilation of the report and is being attended by top state functionaries besides,parents of martyred kids,teachers and admins the school and other conscientious Pakistanis . 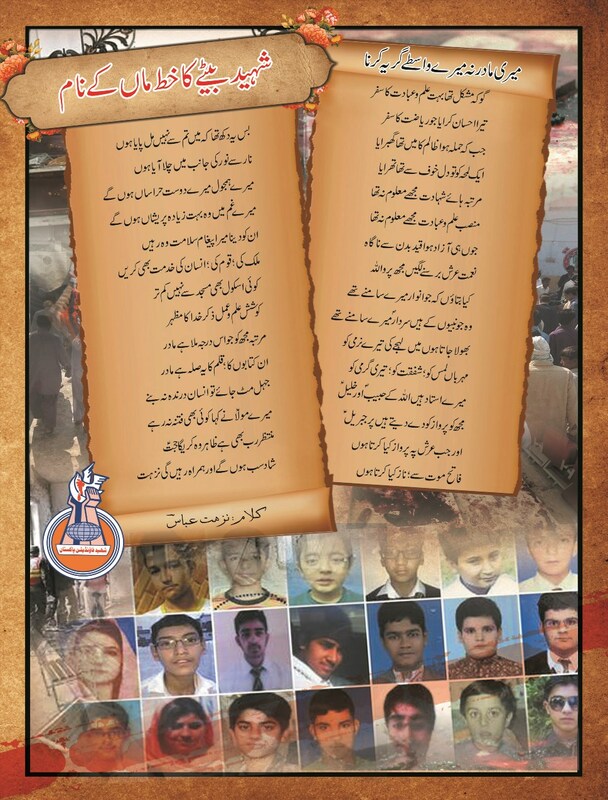 Some 144 kids were martyred on 16th December 2014, at APS Peshawar when a number of yazidi terrorists sneaked into the school and continued their killing spree, from one class to another class and on ,as revealed later by the survivors of horrific tragedy. Army Public Schools and Colleges are considered among premier educational institutions of the country,known for good standard of education and discipline, with a huge Alumni serving Pakistan in armed forces , in other government and private organizations as well as expatriate Pakistanis. Our heart also goes out to the families of all Pakistanis martyred at the hands of terrorists during last two decades as a consequence of the blind adherence and subservience of our national priorities to objectives of international arrogance and zionism. Our heart also goes out to the families of tens of millions of children of tribal areas and people of neighbouring Afghanistan whose people borne the brunt of our territorial ambitions ,flawed strategies and blind adherence to Zionist plan to invade resource rich central Asia . The only outcome of the adventure has been sheer embarrassment ,only if one has eyes to see. Our heart also goes out to the families of all martyrs of Millat-e-Jaffaria Pakistan who have been martyred during last five decades or so by takfiri terroists as a consequence of the blind adherence and subservience of our national priorities,leaders and institutions to objectives of international arrogance and zionism . Martyred,in utter oppression,the families of beloved martyrs of Millat-e-Jaffaria were not lucky enough to receive a single word of sympathy from any corner,let alone any support. Pakistani nation has already paid a high price for the lopsided policies being relentlessly pursued by successive regimes over last five decades,without any doubt,every single drop of blood has been spilled because of their complicity with terrorists,negligence,in-aptitude and greed . Without any doubt ,the sacred blood of martyrs will help Pakistan nation rise up from the slumber of indifference and identify the real enemies in global arrogance and the guardians of their interests in our national fabric. God willing ,Pakistan nation will beat the menace of terrorism with unity,love,awareness . It is time to cultivate message of love ,peaceful co-existence,co-operation in every heart and soul so that our coming generations can be inherited a paradise on earth -insha Allah. On this occassion , Shaheed Foundation Pakistan extends our heartfelt condolences to the families of beloved martyrs and express our gratitude towards them for continuing with preseverance the message of positivity ,education ,patience,steadfastness against terrorism. At this crucial juncture of tribulation and trial ,Millat-e-Jaffaria Pakistan stands shoulder to shoulder with the families of beloved martyrs.